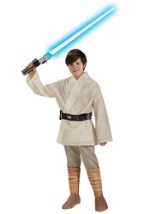 This cute baby costume is a great addition to any Star Wars party or group. The soft white robe is comfortable for your tot and the Leia bun head piece has a 20" opening. The belt is attached to the robe and Velcros shut in back. You'll love your little girl in this Princess Leia baby costume.